HIGHLANDS and Islands Green list MSP John Finnie has reiterated his call for a moratorium on new fish farms ahead of a debate by the parliament’s rural economy committee into salmon farming in Scotland, on Wednesday. Finnie, who is the Scottish Greens’ rural and island communities spokesman said that a temporary ban on new developments would give the industry and its regulators the time to control environmental pollution, high fish death rates and the impact of farmed fish disease on wild fish. The committee has already come out against such a moratorium saying that there is insufficient evidence to justify such a step. Disagreeing with this view, Finnie said that in his view all the evidence gathered by the inquiry pointed towards the need for a moratorium. “In my view there is plentiful evidence that a moratorium is justified, to give the industry and regulators time to control environmental pollution, high fish death rates and the impact of farm fish disease on wild fish,” he said. CELEBRATING its 25th anniversary, Shetland Youth Theatre is planning to bring Shakespeare’s The Tempest to the stage later this year, but is first offering a series of workshops to help develop the skills required to participate. Over the years there have been major Shakespeare productions in Shetland – Romeo and Juliet performed in Leask’s old garage, Macbeth in Scalloway Castle and A Midsummer Night’s Dream in Walls community garden. A spokesperson for Shetland Arts said many people were terrified of Shakespeare whose plays are perceived as difficult and incomprehensible but who actually was a storyteller for the masses not the elite. “So to start the project Shetland Arts will be running a series of workshops designed to make Shakespeare accessible to young people,” she said. HOUSEHOLD water charges in Shetand will remain among the lowest in Great Britain in the coming year. Scottish Water on Thursday confirmed that an increase in household charges is again being limited to 1.6 per cent across all council tax bands – around £6 a year for the average household, providing stability in charges for customers. 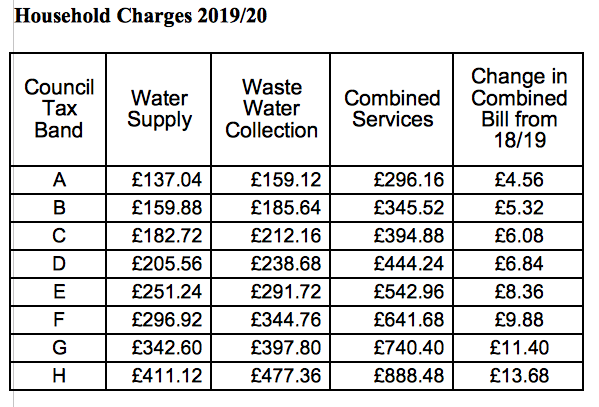 It means the average Scottish Water household charge in 2019/20 will be £369 – around £1 a day. Chief executive Douglas Millican said: “We are absolutely focussed on continuing to deliver water and waste water services for our customers which are among the best value in the UK. He said Scottish Water was investing more than £600 million annually in its network – to make sure it is “robust and resilient” for decades to come.